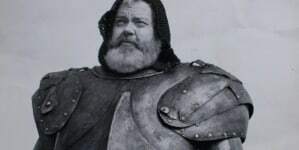 Orson Welles was a genius. The legend that surrounds him – his early success, his seemingly a priori knowledge of how to use film form to tell incisive, dazzling stories, his talent for cinematic trickery, his epic failures – is justified by the diverse, broad and divisive body of work he left behind. In Filming Othello he presents himself as this genius, if a slightly humbled version of him, and the film itself is successful enough as a revelation of his methods to reinforce the presentation. But it also shows that he may not have been the kind of genius he thought he was. Filming Othello is the kind of project that Welles turned to toward the end of his career, after the funding for the immense works he had always imagined had dried up. 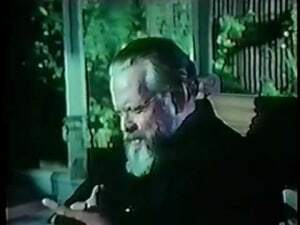 It consists mainly of Welles sitting in front of an old reel-to-reel editing machine, a Movieola, and monologueing directly to the camera about his 1952 classic Othello, in which Welles himself played the Moor and the English actor Michael MacLiammoir played Iago. 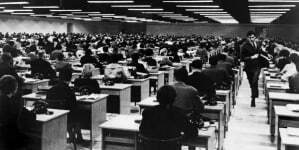 He goes into depth on the film’s budget crises, its fragmented shooting schedule and the creative solutions he found to circumvent his lack of resources. He breaks up his monologue with two chunks of footage, both of which involve him waxing philosophical on his Othello; the first is a chummy conversation over dinner with MacLiammoir and actor/director Hilton Edwards; the other is a question-and-answer session he gave to an audience at Boston University after a screening of Othello. In these bits we see Welles talking about his artistry in vague, rambling terms, grasping for a way to understand the power within himself that made Othello a great film despite everything the world tried to do to stop it. 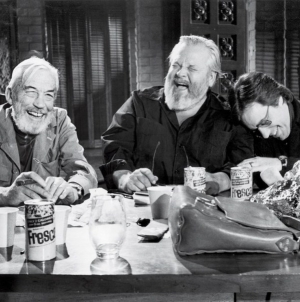 It’s a very personal documentary, and, watching it, it’s hard to think that Welles would have used the same conversational/confessional form if in 1978, when this film was released, he had been able to secure funding for another narrative feature. He may still have made little essays like this about his own work, but they almost certainly wouldn’t have had the air of sadness that tinges Filming Othello. Welles’ tone in this film – beneath the magnanimous genius presentation – is clearly one of disappointment. 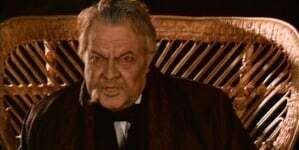 He seems to think, as he talks to the camera with his baritone voice and exceptional vocabulary, that he’s fooling his audience into seeing him as a contented elder statesman of cinema. But the bemused charlatan persona he adopted in F for Fake is turned inside out in Filming Othello. The great artist can’t hide his air of defeat, and very possibly (Welles doesn’t like to be direct) he intended to hint at it. 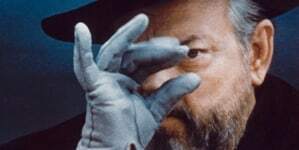 Regardless, the film feels like a big sigh, like Welles letting us know that he has few tricks left and showing them to us with the implication that he has lived out his legend. His films are often praised for the verve with which they reveal the hidden lives that ruin the facades of great men. Had Welles been able to complete more documentaries deconstructing his own films, we may have had a more complete understanding of the sad trajectory of his career. This is the only one he finished, so it exists as another fascinating piece of the Welles puzzle. Alex Peterson is a preschool teacher, student and critic currently living in Portland, OR. His qualifications include ownership of a few books by Stanley Kauffmann and a degree in film from a now-defunct college down in New Mexico. A boon to film lovers.